Larry Maguire, Far Niente President and CEO, looks forward to a cruise he and his wife are taking this October – and invites you to join them! 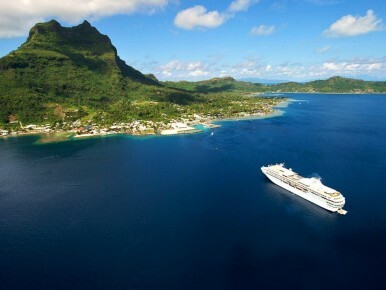 Last month we sent an email to our wine club members about the upcoming cruise in Tahiti with my wife, Karen, and me. We heard back from a number of people who indicated that they wished they could join us but were unable to attend. A few people said that the cruise was exactly what they needed and they will see us on board. Vincent, one of our wine educators, and Donna, our wine club concierge, both had 20 good reasons why they should go along, too. I’ve been wondering why Tahiti is so alluring to me. Perhaps it comes from growing up in the shadow of Disneyland’s Tiki House. After years of audio-animatronic macaws, maybe I need to see the real thing. The Gauguin thing is a no-brainer. Before teenage boys know what Impressionism is, they notice the works of Gauguin and his Tahiti. What movie buff wouldn’t want to see the exotic islands and people who inspired crew of HMS Bounty to mutiny? Yes, it’s all of that plus the thought that Captain James Cook navigated the islands and that Charles Darwin visited Tahiti while aboard the HMS Beagle. I want to see this land that inspired people to write about a utopian society. On board the beautifully renovated Paul Gauguin this October, we plan on hosting relaxed wine tastings, casual seminars and sumptuous dinners with magnificent wines all in serene, Polynesian settings. I imagine myself standing in waist-deep water with a glass of Far Niente Chardonnay and my arm around Karen. I’ve always been a romantic, so off we go on a small cruise ship to experience the ultimate “Dolce Far Niente,” a land where we can sweetly do nothing. We couldn’t be happier. Why not join us? Click here to find out more and to reserve your space.